We offer existing patients complimentary 20-minute, no-obligation treatment assessments. These ensure suitability, discuss the procedure, and advise on future maintenance. Implants are the revolutionary way to replace teeth that have been lost through decay, gum disease or because of an accident. A missing tooth can lead to self-consciousness, eating difficulties, and speech impediments. We can offer porcelain and precious metal implants supported by biocompatible titanium rods that are fixed permanently into the jawbone. Over several months, the body accepts the implant before a crown is attached to the root that looks, feels and functions like a natural tooth. 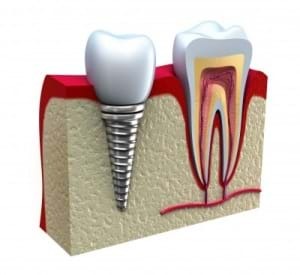 Implants are long-lasting and free-standing, so there is no damage to the adjacent teeth. They can be treated with a toothbrush and floss just like natural teeth. Implants are stronger than natural teeth and many patients report the renewed ability to eat a variety of foods that they could not previously manage. We are proud to have been awarded membership of the British Dental Association Good Practice Scheme since 2011 and we are constantly trying to improve the quality and range of services we can provide to our patients. To provide the highest quality dental care across the whole spectrum of dentistry.